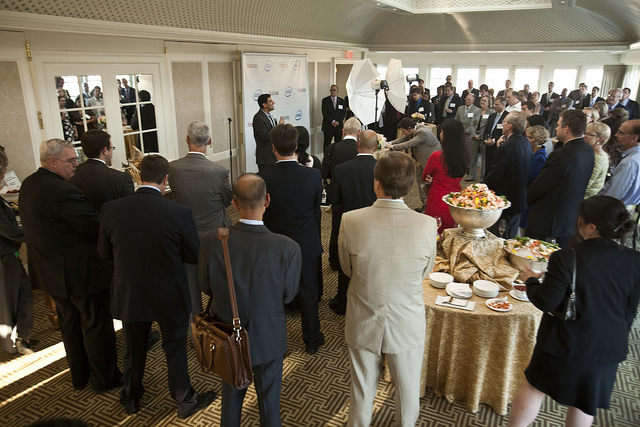 Federal government’s information technology leaders came together on Tuesday night for a reception hosted by FedScoop, sponsored by Intel honoring outgoing Federal Chief Information Officer Vivek Kundra on the rooftop of the Hay Adams Hotel. The event brought more than 100 executives from the White House, every major federal agency and the biggest names in industry to honor Kundra for his two and a half years of service as the nation’s first Federal CIO. “I am very very humbled and honored that I had the opportunity to serve in the White House and am thankful for all the friends that I’ve made for life,” Kundra said. Kundra thanked the fellow members of the CIO Council and all those he worked with in his position, saying he couldn’t do his job without everyone who stood behind him. He said that he can now go to sleep peacefully knowing all “the great people” who work within the federal government. This was Kundra’s first major appearance since his final day at the White House on Friday. He is leaving for a fellowship at Harvard University, conducting research at both the Berkman Center for Internet & Society and the Joan Shorenstein Center on the Press, Politics and Public Policy. Kundra was praised during the ceremony sponsored by Intel for his innovative approach to government, namely his efforts to ensure openness and transparency, lower the cost of government, cyber-security, participatory democracy and innovation. He was also praised for being an agent of change. He was also presented an award by Department of Homeland Security CIO Richard Spires and Office of Management & Budget Senior Advisor to the CIO Council Adam Sedgewick on behalf of the CIO Council for his contributions to the federal government during his career. The event was attended by a number of CIOs and other C-level executives throughout government, including new Federal CIO Steven VanRoekel. Kundra praised the selection of VanRoekel as his replacement, saying he has a track record of innovation and thought leadership that will serve the administration wonderfully. “He’s the perfect choice,” Kundra said.